What determines an ecosystem? The plants and animals, right? Not quite, yes those are what help to define one type of ecosystem from another, but there are other factors that cause ecosystems to develop the way they do. Ecosystems develop in specific places based upon their geology, climate, and altitude. Over the past century the average temperature of the earth has risen 1.3°F. There are places in the world where the temperature has risen double that, and still others where is has barely risen at all. In both circumstances however, we can see it affecting the ecosystem. The effect of the warming earth is more dramatic in northern parts of the world. An article in the Huffington Post addressed one area in particular where it is hard to tell whether or not the changing ecosystem is a bad or good thing. In Alaska there has been a population explosion of bark beetles, which have existed in Alaska for centuries, but lately their population has not been kept in check by the cold temperatures. This is an example of how the climate, a non-living thing, is effecting the life of an ecosystem, showing that everything plays a role in defining what an ecosystem is, not just the flora and fauna. Due to the warming weather the bark beetles were able to infect more and more trees, and within the past 20 years wiped out enough white spruces to cover the entire state of Connecticut. 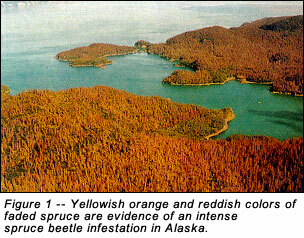 The effect of the bark beetle take over affected every living organism in Alaska. Fewer spruces caused for there to be less shade on the forest floors, allowing grasses to grow. This benefited herbivores such as moose and elk, and also changed the temperature of the soil allowing other forms of vegetation to move in. This essentially completely changed the makeup of the Alaskan forest. While making the soil more friendly to other types of vegetation may sound like a good thing, the wipe out of most of the white spruces hurt many other organisms such as predatory birds. Voles, a small rodent, were both a key piece in spreading beneficial fungi throughout the forests and were prey for a number of predators. This has caused for several of the residing species to move out as the forest changes. Since we have looked at both the beneficial impacts and negative impacts of changing ecosystems how do we decide if it is overall a good thing or a bad thing for our ecosystems to be changing? I personally believe that the changing of any ecosystem great or small is not a good thing. I experienced the changing of ecosystems first hand in Maine where the migration of lobsters and green crabs was hurting the economy of the Maine coast. Since the temperature of the water has been getting warmer and warmer up the eastern coast, lobsters have been migrating up toward the cold waters. Green crabs on the other hand have been following the warm water into the Maine Coast. Green crabs eat the same foods as lobsters and other shellfish. The Maine coast relies upon the farming of lobster and scallops for a decent amount of their economy, and so in this case in particular the changing ecosystem is a bad thing. If in some areas the changing ecosystem benefits the people living in that area, then it can be classified as a good change. But is it really good? What if the change wipes out the last of a certain species? Do the pros of an ecosystem changing outweigh the cons? Claire, I really like the way you first say that it’s hard to tell if the change in ecosystems is a good or bad thing. I can see where it’d be a bad thing for the Maine economy that lobsters are migrating, but what are the effects on the environment? If the lobsters can thrive farther north and the crabs replace the lobsters, is it really such a bad thing? I’d be really interested to hear about times when the changing ecosystem might actually be a good thing for the environment and/or the surrounding economy. I wonder if there’s any cases where people’d actually rather have the ecosystem change for their own personal benefit (i.e. betters the local economy). Great post! Claire, you well explained how the global warming affected the forests in Alaska. Great Job! I agree with you that “the changing of any ecosystem great or small is not a good thing”. I believe that human activities are the causes of the changing. I think you have read this but I still want to use Dale’s article of the effects of dams on alewives (http://blogs.chewonki.org/semester/2014/04/alewifes-a-human-ecology-project/) as an example of how human activities affect ecosystems. I can’t wait to learn more about the change on the Maine Coast and start my own human ecology project.